I often feel like everywhere I look I am surrounded by negativity. Whether it's in the news or those around me with negative attitudes. Sometimes it's even me. The circumstances of life get us down. We see the bad side of things and there our focus lies. Or we believe lies about ourselves, whether it's lies we heard from other people or lies the enemy has told us. Negativity seems to come so easy. 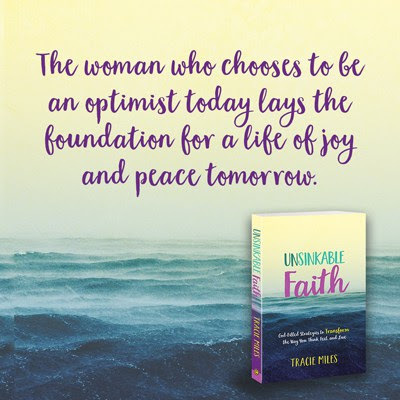 In her brand new book, Unsinkable Faith, Tracie Miles teaches us how to change our negative thought patterns and place our faith and hope in God. 5. Discover that when you change the way you think, you change the way feel, and in turn you can change your life completely. Each chapter has chapter challenges, strategies you need to transform your negativity into positive faithfulness and verses to memorize for mind renewal. Whether you struggle with negativity or you are tired of the negativity around you, pick up Tracie's book Unsinkable Faith today! This sounds like it was written just for me! I really struggle with being negative.